24th March, 2006. In this issue: Last days on March Specials, Places now Interactive, New Article - Why Diesels are Different, Pick this Place Competition and ExplorOz is running an Auction. News from Jackie - With Easter and school holidays almost upon us, you may be planning a trip departure in just a matter of weeks. We also have limited stock on our playing cards range which are currently 20% off RRP. In recent weeks we have seen the Desert Parks Passes sell like hot cakes! We have just received more stock in this week, so now is a great time to buy! Please note that we can date the pass relevant to when you are departing. We have had quite a few enquiries relating to this lately. You just need to advise us of the date in the comments field. This also refers to the WA permits. Also in the school holidays it might be nice to sit back and read a book. We have quite a range. Just have a look under books both Inspirational and Explorers. Quite some interesting reading. The Emergency Trauma Pack is on special for 20% off the RRP for the month of March. The autobiography of RM Williams. Have you read it yet? This guide features 20 touring routes in the SE New South Wales and East Gippsland regions. 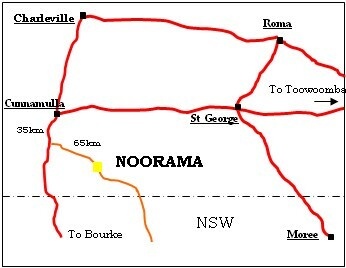 The district of Noorama (near Cunnamulla, Qld) dates back to the 1880's and is rich in pastoral history. The Noorama Picnic Races has been an annual event here for 40 years and for visitors comes gift wrapped with famous bush hospitality. This year, Race day promises a feast of entertainment and the Race Club extends a special invitation to readers of ExplorOz.com. There's plenty of area to camp with hot showers and toilets at the grounds, as well as a complimentary breakfast next morning. Win money at the gate based on luck; be one of the best dressed man or woman for more rewards; roving magicians and wizards have a pied piper affect on all the children; and the quality racing is recognized with trophies for the most successful trainer, jockey and owner of the day. The event will continue into the evening with the patrons invited to enjoy the live band and clay pan boogey - plenty of dust flys during the boot scootin - jitter buggin. A fully stocked bar operates well into the evening and there's catering on course all day, including an excellent evening meal. Enthusiastic crowds, the high standard of racing , strong sponsorship and a dedicated committee, all contribute to making the annual Noorama Picnic Races a day to remember. The Places index page now also contains a LATEST UPDATES button. Please appreciate that this system will be more useful as a resource to others if you can provide the GPS coordinates, altitude and some nicely worded and keyed text so give a little thought to your submission. However, the only mandatory fields required are: Name, State and Type of Point. The system will alert us to all updates, which will be verified by us so please feel confident to have a go! This new article, added to both our Servicing and Mods Topic, as well as our Vehicle Choices Topic, ensures the ExplorOz site holds a technical page that explains the workings of the automotive diesel engine and especially, the fundamental differences between diesel and petrol engines. Do you want the luxury of instant and continuous hot water when camping or fishing? Make it a certainty with a Helton Heat Exchanger fitted to your vehicle. Designed to suit almost anything with a water cooled engine they are easy to install and are the most compact type on the market. All heat exchangers are available as a bare unit or as part of a complete installation kit. We produce three types of heat exchanger to match various applications; shower units, hot water systems and storage units. The shower units are made with a range of inlet/outlet configurations. 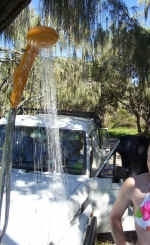 The hot water unit is designed to deliver water at just below engine running temperature. The 1 and 2 litre storage units were developed for camper sinks and similar applications. We have also recently introduced a biofuel heater for biodiesel and SVO. Helton Heat Exchangers are 100% Australian owned and we use Australian products to manufacture our heat exchangers. Backed by a 5 year warranty, Helton is a quality product that won't let you down. Wow, some people really know the Places of Australia! We are amazed at how quickly some of the Places are being guessed. As you may have noticed, the competition photo is usually what we determine to be the most unusual, and it is not until a correct answer is guessed, that the mystery Place will be become visible in the Places system with a new main photo (the most obvious) will be featured, along with up to 8 photos and all supporting information. Why not take a browse around the 31 past competitions and see what information has been entered into Places as a result of these submissions. To submit pics to the competition - we no longer need to be emailed the pics, simply upload via adding a new Place to thePlaces system. Did you know that ExplorOz is currently running an Auction? Come and take a look.... you may be surprised!